Everyone’s heard of the IoT – smart thermostats, Internet-connected refrigerators, connected lightbulbs – but there’s a subset called industrial IoT that has a much more significant day-to-day impact on businesses, safety and even lives. The term IIoT refers to the Industrial Internet of Things. In broad strokes, it’s the application of instrumentation and connected sensors and other devices to machinery and vehicles in the transport, energy and industrial sectors. What that means in practice varies widely. One IIoT system could be as simple as a connected rat trap that texts home to say that it’s been activated, while another might be as complicated as a fully automated mass production line that tracks maintenance, productivity and even ordering and shipping information across a huge, multi-layered network. What happens when an IoT implementation goes bad? The industrial internet of things is also referred to as the industrial internet (a term coined by GE) and Internet of Industrial Things. Whatever you call it, the IIoT is different from other IoT applications in that it focuses on connecting machines and devices in industries such as oil and gas, power utilities and healthcare. IoT includes consumer-level devices such as fitness bands or smart appliances and other applications that don’t typically create emergency situations if something goes wrong. Simply stated, there is more at stake with IIoT deployments where system failures and downtime can result in life-threatening or high-risk situations. The IIoT brings computers from IT to operational technology, opening up vast possibilities for instrumentation, leading to major efficiency and productivity gains for almost any industrial operation. 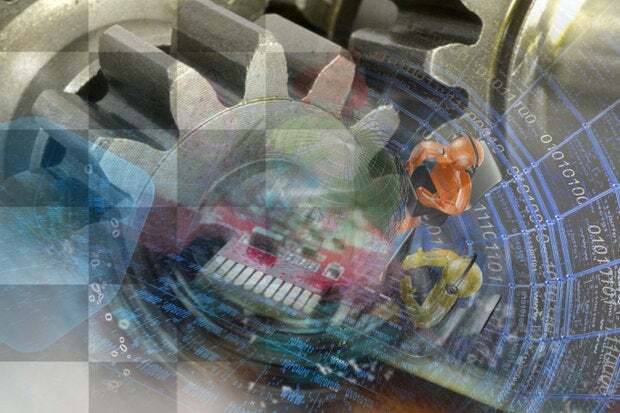 Technologically, IIoT works on similar principals to any other piece of IoT tech – automated instrumentation and reporting being applied to stuff that didn’t have those capabilities before. That said, the scale of it is much different than a simple system that lets you mess with your thermostat on your phone – hundreds, perhaps thousands or even tens and hundreds of thousands of individual endpoints can be present in an IIoT deployment. Instrumentation for production lines can let companies track and analyze their processes on an enormously granular level, asset tracking can give a quick, accessible overview of a huge amounts of material, and predictive maintenance can save companies big money by addressing problems before they have a chance to become serious – the number of potential use cases is vast, and growing by the day. Freight, goods and transportation monitoring. Smart metering and smart grid. Smart farming and livestock monitoring. Asset tracking and smart logistics. Ozone, gas and temperature monitoring in industrial environments. Safety and health (conditions) monitoring of workers. Yes, because IIoT devices can have much longer service lives than consumer gadgetry – Canonical executive vice president of IoT and devices Mike Bell estimates the average at seven to 10 years – so any implementation has to be built to last. Even beyond the raw scale and longevity involved, the implementation process can be convoluted – the kind of back end necessary to make the most of data gleaned from instrumentation is a considerable undertaking in and of itself, and has to be undertaken in close coordination with the rest of the enterprise. It requires a dedicated strategy for collecting data from endpoints, storing it in an accessible format – whether in a data center or in the cloud – feeding it to the analysis engine, and having a way to turn insights from that analysis into actionable and timely information. There's a wide range of different formats and technologies that address different parts of the need for machine-to-machine communication among connected devices. Physical layer technology like Sigfox and Zigbee, software layers like Weave and IoTivity - all of it is necessary for a fully functioning IIoT environment, and it all has to be interoperable. Just like consumer IoT, IIoT has a lot of security issues. Recall the Mirai botnet, which leveraged poorly secured security cameras and other gadgets into a huge DDoS weapon. Beyond the possible use of compromised IIoT devices to create massive botnets, there’s also the issue that vulnerabilities can be exploited to allow theft of valuable data already on your network – yet another attack vector. One thing that might help keep IIoT secure, according to Bell, would be to borrow the increasingly common practice of automatic, silent downloading and patching from the consumer side of IoT. Some companies won’t like this, preferring to have absolute control over the software running on their machines, but it could be a big help from a security perspective. Lack of standardization. As an attempt to graft newer technology onto old, there's a huge range of different designs and standards for everything from transmission protocols to ingestion formats. Simply put, if the gizmo that sends operational information about the temperature of a blast furnace isn't made by the same company that makes the network or the data ingestion engine, they might not work together. Integration with legacy technology. Lots of older equipment isn't designed to provide data in a format that's legible for modern IIoT tech, so getting a decades-old power station controller to talk to a sophisticated new IIoT infrastructure could require some translation. Money. As both of the above points highlight, fully embracing IIoT requires new hardware, new software and a new way of thinking about technology. The idea is to make money, but plenty of people are understandably worried by the up-front costs. People. Getting the most out of IIoT often requires expertise in machine learning, real-time analytics, and data science - to say nothing of cutting-edge knowledge of networking technology.